I recently had the opportunity to review Food52’s Vegan Cookbook by Gena Hamshaw. When it first arrived in the mail I was so impressed by just the outside of the book. It’s hardcover (the best! ), and the spine of the book is really unique too. It reminded me of of a vintage book with textured tape. The word “VEGAN” is set back further than the rest of the text. It’s really nice! I quickly went through the book to check out if any recipes popped out at me, and in all honesty almost all of them were recipes I wanted to make right away! Each recipe also has a beautiful picture that made it easy to want to make everything. I quickly flagged most of the book! Take a look inside the book here! The book has 6 sections: Breakfast, Appetizers & Snacks, Soups, Salads, Main Dishes, and Desserts. I was able to find at least 2 in every category that I needed to make ASAP, and more than that in most of the categories. Some of the recipes that popped out at me right away were the Green Smoothie with Avocado, Five-Minute No-Bake Granola Bars, Parsnip Fries with Spicy Harissa Mayonnaise, and the Quinoa Salad with Sweet Potatoes, Kale, and Pesto Vinaigrette. I went to the store the day the book arrived and stocked up on all the ingredients I needed! One thing that is really nice about this book (at least for me), is that it uses many common ingredients that an everyday cook would keep on hand. Things like oats, quinoa, nut milks, and more. Some maybe less common, but ingredients I always stock up on are nutritional yeast, cashews, almonds, pumpkin seeds, sunflower seeds, kale, etc. I barely had to buy anything because most of the ingredients were really common for me. The other thing I loved about this book is that the cooking methods are all fairly simple, especially if you are familiar with easy things like roasting veggies, or cooking quinoa. It’s all pretty easy cooking techniques. The first one I made was the Green Smoothie with Avocado. I would definitely consider myself a smoothie expert! I make one every single morning, and am also blending my way through the “365 Vegan Smoothies” book one smoothie at a time. So I have made a ton of smoothies, and a ton of green smoothies at that. This smoothie was delicious! I was really impressed with the texture and the lack of flavors from the “unique” ingredients in the smoothie. I couldn’t taste the greens or avocado at all, which is good right?? It was crazy creamy! My only critique is that I think it is big enough for 2 people, and the serving size says 1. But if you like a giant smoothie (more than in the picture), then it would be perfect! I put the rest of my leftover smoothie into popsicle molds and stuck them in the freezer. They were perfect for this too because they were so creamy! Next were the Five-Minute No-Bake Granola Bars. These were so good! I’m not even a fan of granola bars, but these looked so tasty and easy, I had to try! They are made with oats, pumpkin seeds, raisins (I used dried cherries), almond butter, agave, and salt. These are packed with healthy ingredients and taste delicious! These kind of reminded me of a no-bake cookie, they were that good! They didn’t stay together as well as the picture seemed to, but I didn’t really care. I liked the smaller bite size crumbles! Oh and does there have to be granola in granola bars? This one didn’t have any… but oh well! Then I made the tofu scramble! This was a little different than the ones I’m used to, for the good and bad. She mentions that she is not keen on creating “faux” versions of nonvegan dishes in the description, but if I’m going to try to make it I want it to taste like the real thing! That being said, this was really good, it just didn’t really taste like eggs. I loved going out of my comfort zone a bit and adding tons of veggies and greens. I usually just add onion and garlic to mine. The veggies were really good in it! I added some organic ketchup and put it on some whole grain toast, it was soooo good! In order to achieve a more “eggy” taste I just added a bit of black salt to the dish. If you have never tried black salt on tofu, it’s perfect for egg like dishes! It has a really weird sulfur flavor that mimics eggs exactly! Last night I prepped the Muesli so I could have it for breakfast this morning. I was really surprised how good it was! I thought having cold oats would be kind of weird, but it was really great! 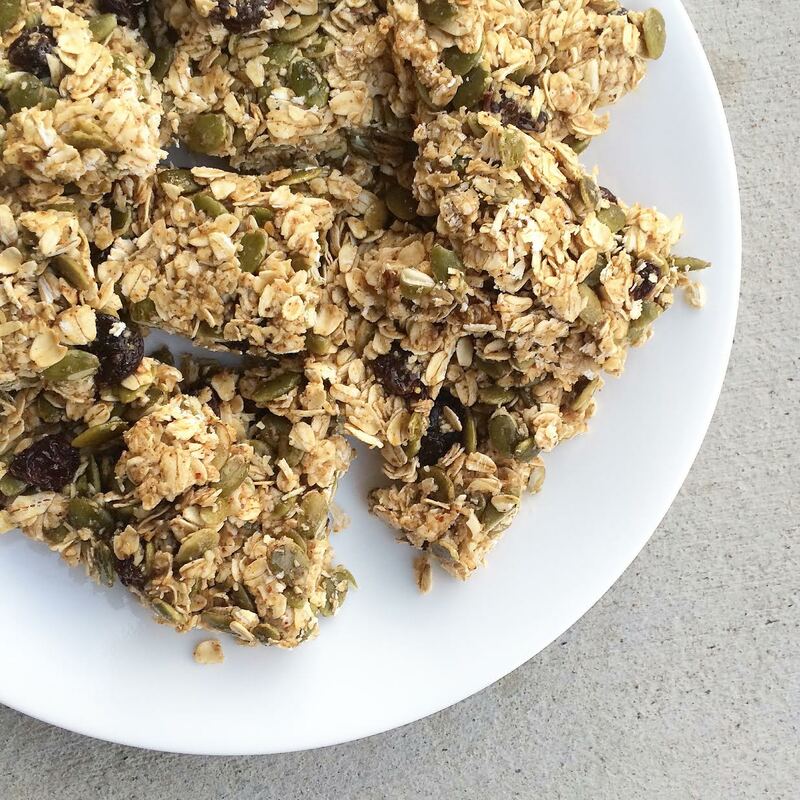 I wasn’t planning on making this recipe at first but when I noticed that it shared a lot of ingredients with the Five-Minute No-Bake Granola Bars, I thought I may as well! Again I used dried fruit (cranberries) because I don’t like raisins. 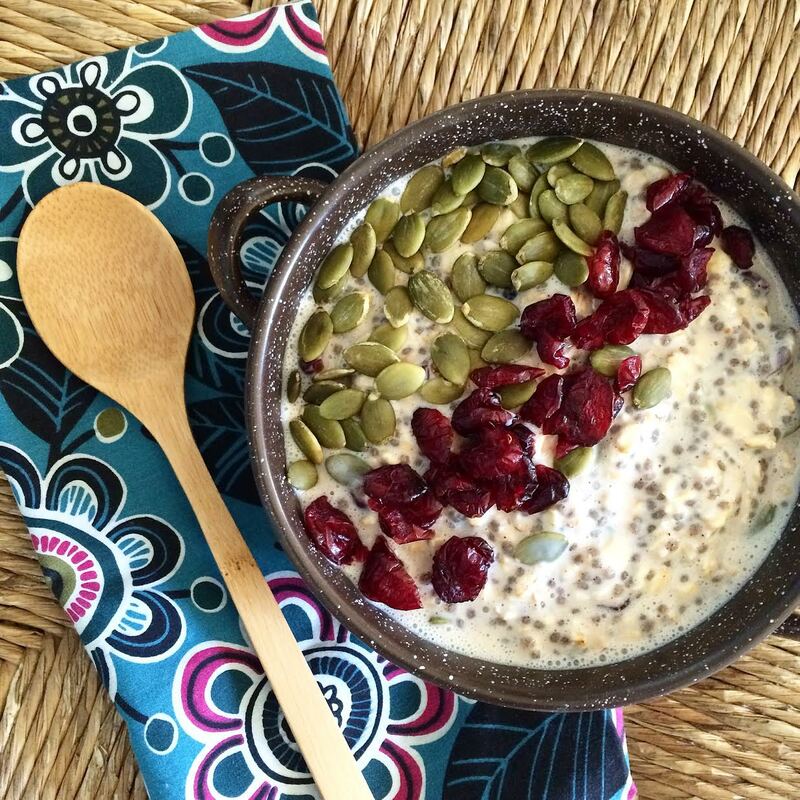 I topped it with more pumpkin seeds and cranberries when I served it. I cut the recipe in 1/2 and it was still a lot. Definietly serves 4 (like the recipe says). But I’ll finish the rest tomorrow! My toddler loved it too. The last recipe I made were the Parsnip Fries with Spicy Harissa Mayonnaise. The picture of these looked so good, and I happened to see parsnips at the store the other day, so I thought I’d give it a try. I definitely went out on a limb with this one. I had never tried parsnips before and I had no idea what harissa was. I got the parsnips but my store didn’t carry harissa. I did a quick search for a recipe and decided to just make it from scratch. That was interesting! I learned a lot! Anyway, I thought it was going to turn out terribly every step of the way because I was so unsure about the ingredients, but it was really really good! The only recipe I tried that I didn’t love were the Crispy Roasted Chickpeas. I’m not sure this is the author’s fault because I’ve tried packaged ones in the past and hated them, I just wanted to give fresh ones a try. I really hated them, and most of them burned, but my toddler ate all of the ones that didn’t. I guess I’m just not a roasted chickpea person. But it wasn’t a total loss! I had never soaked and cooked my own dry beans before, and it was so easy! I’m super grateful I tried this recipe because this is how I am going to have beans from now on! I still have so many recipes flagged that I am going to try, some I already have ingredients for! The Polenta Square with Sun-Dried Tomato and Walnut Tapenade is up next! Then I’m planning on making the Butternut Mac and Cheese tomorrow night and the Double-Chocolate Brownies for dessert! This book is all around amazing! I own 100+ vegan cookbooks, and I have to honestly say that this is in my top 5! I have never had a cookbook with so many recipes I needed to try right away! The only improvement I would suggest for this book, and it really is personal preference would be the page numbering placement. It’s in the middle and a little towards the spine so it’s not as easy to navigate. I would also like more recipes since there are only 60, but 60 great recipes is better than 200 recipes with a bunch of failures. Overall I give this book 2 thumbs up and would recommend it to anyone! I couldn’t be happier! I received this book from “Blogging for Books” for this review.